I've been sewing on-and-off on my new sacque for a few weeks now. I only have the weekends to fiddle these days, but luckily progress happens in big leaps and bounds on sacques, which is something I particularly love about them. I'm using Simplicity 8578 for the pattern pieces and pleat markings in back, but I am assembling the gown by hand going by The American Duchess Guide book. 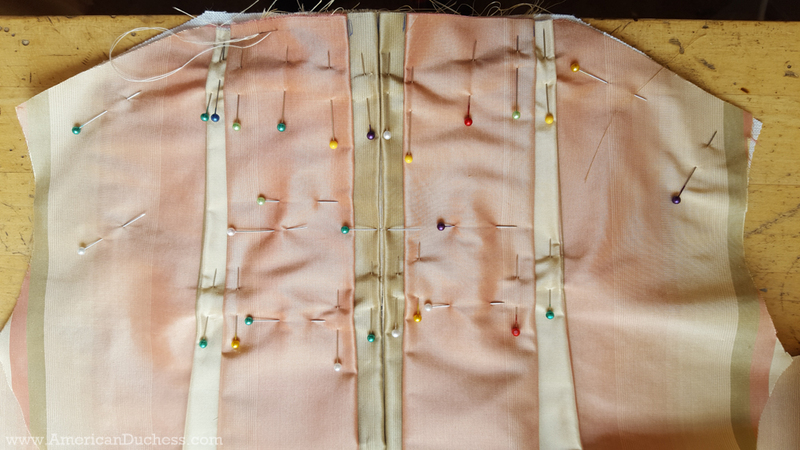 I've pleated the back of the gown up according to the pattern and it worked a treat. 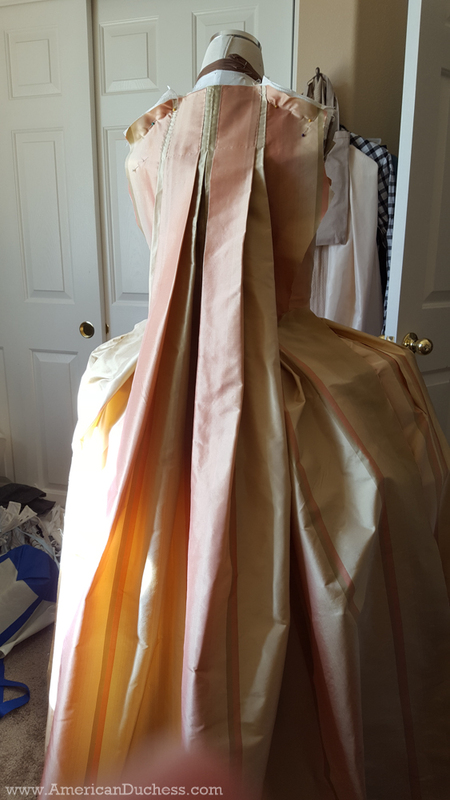 I got the bodice fronts and the back all seamed together, and then moved on to what I think is the trickiest part of the gown - the front skirts. Assembling the bodice - the linen lining is all stitched together and the bodice front pieces of silk applied. All pleated up - we include the hidden third pleat in Simplicity 8578, which makes for those nice, crisp, beautiful back pleats. 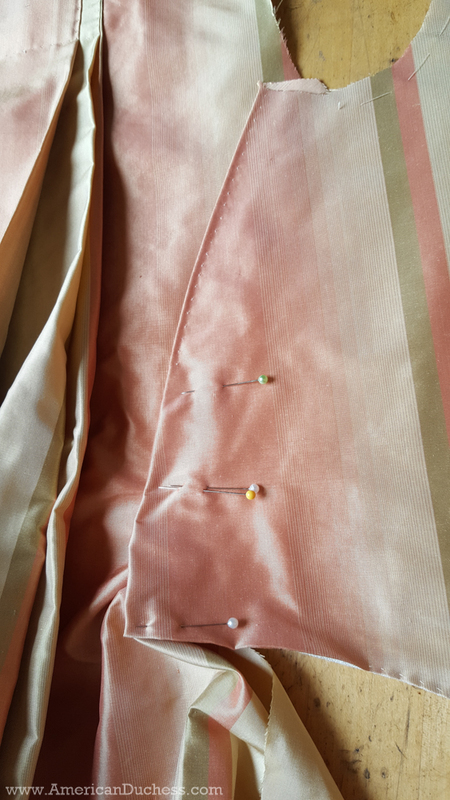 A bit of a trick part - stitching the pleated back to the bodice lining, then turning the side back edges of the fashion fabric and prick stitching down, but not all the way - I still have to access the seam at the waistline. For the skirt fronts I have deviated a little from the Simplicity pattern. 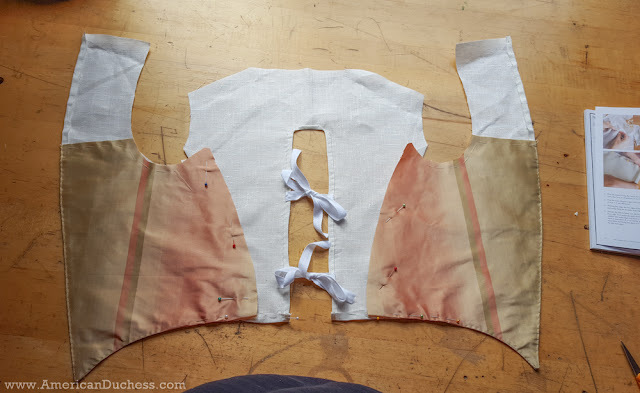 I cut and seamed the gore at the sides, like we do in the book, and plan to fold back the front edges of the skirt pieces to stabilize the front edges and form that inverted 'V' opening that's so attractive on sacques. For those of you working with the Simplicity pattern tissue, I combined the gore and the front skirt panel into one piece for ease of use and pattern tissue space. This means that the width needed at the hem to get around the pocket hoops is still there, you're just relieved of that extra mantua-maker's seam. What's *not* on the Simplicity pattern piece is the fold-back on the front edges. 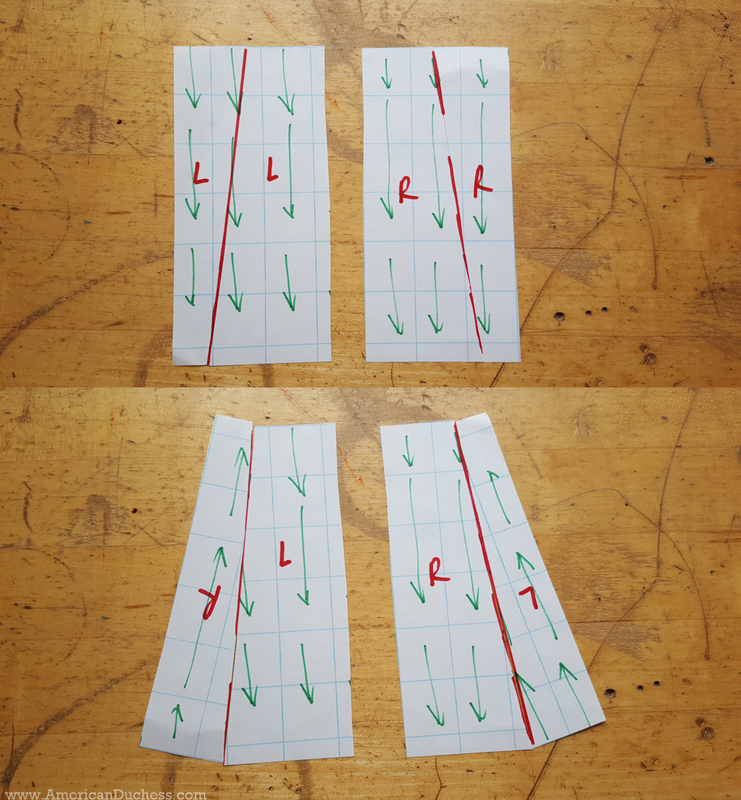 This is because how much you fold back (or if you do at all - both ways are correct) is up to you. 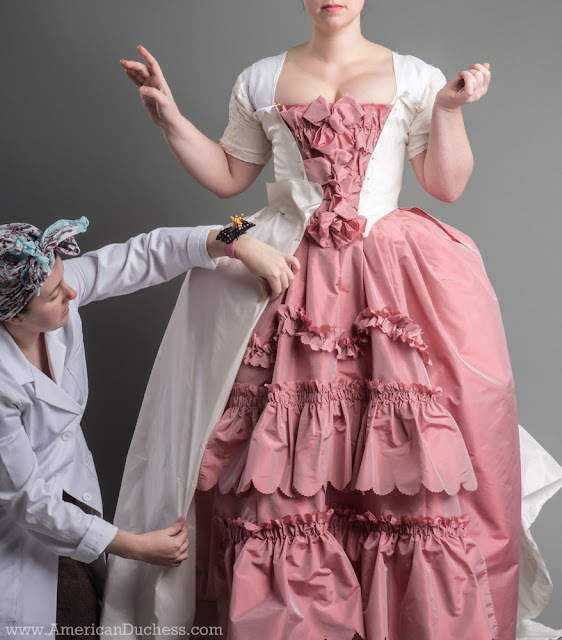 From "The American Duchess Guide" - since I don't have a photo of folding back the gown skirt on my own dress (yet), this is what I'm talking about, shown on the 1768 sacque from our book. I talk about this in the video, but here's the illustration too - the gores on the skirt front panels - do they work with directional fabrics? The quick answer is "no." Lightbulb! I couldn't get the sides to fit the lining correctly. Thanks to your bodice picture I know how to correct it. Smashing! I love the back. I really love that your costuming space looks a lot like mine, with with other stuff going on in the background. So validating, hehe. Thank you for being a constant source of inspiration!